A Fianna Fáil councillor has sent a letter to his party colleagues in local authorities across the country seeking their support for Éamon Ó Cuív to run as a candidate in the Presidential Election. Galway Councillor Ollie Crowe confirmed to RTÉ News that he has written to all Fianna Fáil councillors in the country. He said: "We must run a candidate in the presidential election. In my opinion Éamon is the best elected member we have in Fianna Fáil." He claimed that 95% councillors and grassroots members believe the party should contest the Presidential Election in the autumn. He added: "The party leadership and Mount Street [party headquarters] have made the wrong decision but we can right that wrong with four local authorities nominating Éamon to run." In the letter, Mr Crowe said: "I firmly believe our party should put forward a candidate to the people for the first office in the land and indeed that we have a duty as a political party to do so in the best interests of democracy, along with a responsibility to thousands of Fianna Fáil members across the country to provide a candidate they can proudly support." Cllr Crowe advocated that his party colleagues should nominate party founder and former President E amon DeValera's grandson to run for the Àras. Cllr Crowe said he informed all 260 councillors by email yesterday. He has posted the letter to a number who he was unable to contact via email. Mr Ó Cuív, who is the Fianna Fáil TD for Galway West, where Mr Crowe is a councillor, has not been contactable today. 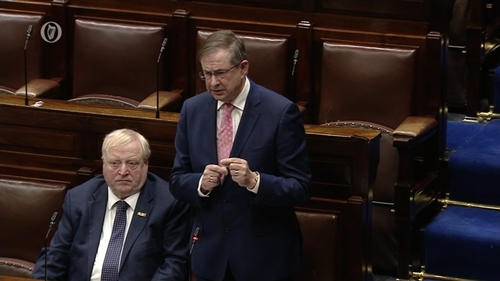 A spokesperson for Fianna Fáil said: "The only body with the authority and ability to nominate a Fianna Fáil candidate for the presidential election is the parliamentary party. The parliamentary party has made a decision with regard to this matter." Meanwhile businessman Gavin Duffy has said he would be a very different President to US President Donald Trump if he were elected. Speaking on RTÉ's Morning Ireland, Mr Duffy said he was not of "big business," and his involvement with the "Dragon's Den" television show was as much a disadvantage as an advantage. He said this was because people thought "Oh reality TV, another Trump president, I would be very, very different." Mr Duffy announced his intention to contest the presidency on Twitter yesterday. Speaking today he said President Michael D Higgins speaks to people's heads whereas he believes he would speak to people's hearts. Mr Duffy said he would love to be meeting the people of Ireland and representing them, expressing the mood of the country at times of national tragedy or truimph. Asked if he was an advocate for blood sports, Mr Duffy said he had defended the Ward Union Hunt in Co Meath, which is not a blood sport. He said the hunt "holds the original indigenous species of Irish red deer. The Green Party went to ban it and if they had there was no plan of what we were going to do with the main herd of Irish red deer in the country." Mr Duffy said he was president of the Hunting Association of Ireland in the past. He said there were 700,000 people around the country involved in rural pursuits like hunting and fishing and he believed they would be supporting him in his election bid. Mr Duffy needs the nominations of four local authorities to secure a nomination, and will begin his campaign by attending a special meeting of Waterford County Council tomorrow. President Michael D Higgins said earlier this month that he will seek a second term as president. Candidates who decide to contest the election will need the backing of either 20 members of the Oireachtas or four local authorities. The Mayor of the Waterford Metropolitan District, Cllr Joe Kelly, has said he decided to invite potential presidential candidates to meet the council as he felt the democratic process was being frustrated by the fact that two big political parties were supporting President Higgins for a second term. Speaking on RTÉ's News at One, Mr Kelly said he felt this was closing the avenue for a potential independent or non-aligned candidate. He said the council would not be announcing their support for a candidate following the meeting as a Presidential Order had yet to be signed. Mr Kelly said what would happen after tomorrow's meetings with Senator Joan Freeman and Gavin Duffy, that a discussion would take place among council members and that a preferred candidate may be chosen, but that no official nomination would be announced.